What Goes Into Preparing Lawn Soil for New Grass Seed? When it comes to lawn care, preparation is half the battle. Before you mow your lawn for the first time, you need to sharpen the mower blade and adjust the blade height for a clean, healthy cut. Before you aerate your lawn, you need to remove any leaves or debris and apply water so the aerator can better reach and penetrate lawn soil. The same sentiment applies to new grass seed. Whether you are seeding a new lawn or an existing one, you need to make sure you have the right foundation in place. This means having a clear understanding of the current state of your lawn soil and knowing how to properly prepare it for the addition of grass seeds. 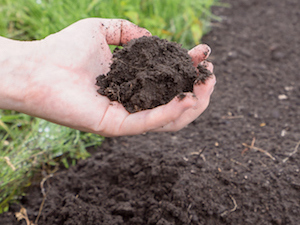 Here’s a helpful roadmap to guide you through the preparation of your lawn soil. What kind of soil are you working with? The answer to this question is one that directly impacts how difficult it will be for grass seeds to sprout. Yet, it remains an unknown factor in many cases. Homeowners who move into a new place may not know much about the soil, while other homeowners may unknowingly attribute poor lawn health in the past to other factors (i.e., not enough water applications). With a soil test, you can remove these uncertainties. Results from the test provide clarity about the conditions of your lawn soil—from its pH level to its nutritional status. From the analysis, you can pinpoint if your soil is too acidic (which creates a breeding ground for weeds and disease) as well as identify nutritional deficiencies that can inhibit plant growth and health. If your soil test turns up with extreme pH levels on either side of the spectrum, it’s time to take action. Because highly alkaline lawns are primarily an issue in arid environments where there is minimal rainfall to filter out acidic elements like calcium, we’ll focus on the issue of highly acidic soil here. Remember that the amount of lime you apply to your lawn will be dictated by the results from your soil test. You’ll also want to time out your applications so that lime is never applied to a lawn that is stressed or dormant. Once you’ve corrected the roots of your soil problem, so to speak, the next step is to address its surface. You’ll want to ensure that the soil surface is as even as possible so newly planted grass seeds receive consistent moisture and equally absorb various nutrients. Begin by walking around your lawn and inspecting it. If you find piles of leaves, large rocks or other debris, use a rake to push them aside and smooth out the surface. Your evenly amended lawn soil is then ready for grass seed. If you’re in the market for professional lawn care services, Weed Pro wants to hear from you. We blend years of experience with a passion for lawn care to keep properties throughout Ohio healthy and green. Reach out to your local provider to learn more.